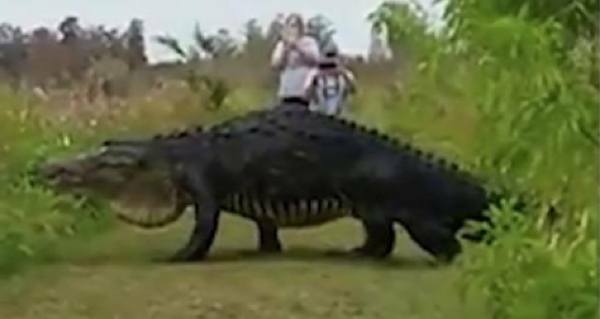 Yet another dinosaur-sized alligator has been caught on camera in Florida. Though its massive size may lead you to believe otherwise, an alligator recently caught on camera in Florida’s Polk County Discovery Center is likely to be real, according to National Geographic. Experts have indeed confirmed that American alligators can grow as large as the creature featured in the now widely-circulated video. The curator of reptiles at the Los Angeles Zoo, Ian Recchio, agreed with Steen’s assessment. Such a size indeed would not be out of the question, as scientists believe that alligators grow throughout their entire lives, which can often last 70 or 80 years. However, until recently, many alligators simply didn’t grow that old and get that big. But because conservation efforts have helped alligator populations rebound, this could be one of the reasons that swamp-goers have been spotting alligators massive enough to be dinosaurs lately. And as alligator lifespans increase along with conservation efforts, who knows how large these creatures may soon grow.